Posted by admin in activity reports, Mayon, Philippines, volcano tourism. Mayon volcano on Luzon remains quiet following its burst of activity last month. The latest Phivolcs bulletin for Mayon, no. 30 of 12 January 2010, reports low seismic activity and ‘weak to moderate emission of white steam’ at the summit crater, with a pale glow visible at the crater overnight. Ground deformation measurements show a deflationary trend compared with early December 2009. Sulphur dioxide emissions have been variable over the past few days: 672 tons/day on 6 January, 1,077 tons/day on 7 January 7, 1,345 tons/day on 8 January, 759 tons/day on 9 January and 820 tons/day on 11 January. The danger of explosions remains, and Phivolcs warns that ‘the 6-km radius Permanent Danger Zone and the 7-km Extended Danger Zone on the southeast flank of the volcano should be free from human activity because of sudden explosions that may generate hazardous volcanic flows’. The Inquirer reports that Phivolcs ‘could downgrade the alert level of Mayon Volcano from 3 to level 2 within a week’s time should the abnormal condition of the volcano continue to wane’. Meanwhile the United Nations Development Program has praised the response of the Albay Provincial Disaster Co-ordinating Council to the Mayon emergency. ‘I have worked in disaster situations in many countries around the world and, in my own professional opinion, the provincial preparedness and planning is amongst the best that I’ve seen … I believe it could make a good case study for disaster management training’, says the UN’s John English. The show Mayon has put on over the last month has certainly been good for local tourism, says the Philippine Information Agency. Tourism and hotel occupancy rates surged compared with December 2008 as thousands of people visited Albay province to see the eruption, although that doesn’t mean that the volcanic activity was, overall, a good thing: the ‘benefits of disaster tourism are simply outweighed by the actual destruction on the livelihoods, crops and properties’. Also putting Mayon’s recent restlessness in perspective is Tito Genova Valiente at Vox Bikol, who reflects on perceptions of Mayon from the nineteenth century to the present: ‘Mayon is really part of Nature, invasive and majestic perhaps, but still indicative of the workings of the Earth’. For all our Mayon coverage: Mayon « The Volcanism Blog. Posted by admin in activity reports, Mayon, Philippines. The latest Mayon bulletin, no. 25 of 7 January 2010, from the Philippine Institute of Volcanology and Seismology (Phivolcs) records a slight increase in activity compared to the previous day’s bulletin: ’20 volcanic quakes and 20 rockfall events’ compared to the ‘4 volcanic quakes and 21 rockfall events’ reported in bulletin no. 24. Sulphur dioxide emission was lower: 672 tonnes/day compared to 1,914 tonnes/day on 6 January. An overflight revealed ‘remnants of lava pile inside the crater’. Yesterday the interaction of rain with hot lava deposits caused 50-metre steam plumes that drifted south-west: Phivolcs reassured local residents that there was no cause for alarm. Almost all the 47,000 people evacuated from area around Mayon last month have now returned to their homes; meanwhile, the Philippine Government is considering the permanent removal of residents from the 6-km radius ‘permanent danger zone’ around the volcano, a measure that would affect over 12,000 people according to a report on GMANews.tv. Phivolcs has warned that ‘small explosions’ are still possible at Mayon. The hazard level for Mayon remains at 3. The latest activity of Mayon still indicates that its overall state of unrest remains relatively high. However, this phase of unrest, characterized by moderate seismicity, high volcanic gas outputs and continuing glow of the summit are processes normally associated with very gradual return to the repose period. The volcanic system is expected to continue producing earthquakes and to vent a large amount of gases because fresh magma still resides along the whole length of the volcanic pipe and near the summit. 1. No ash ejections were observed since 29 December. Steam emission was most of the time weak and white in color indicating considerable decrease in energy and absence of ash. 2. Majority of the type of earthquakes that were recorded during the past days were associated with rockfalls and rolling down of fragments from the lava deposits along Bonga gully and the advancing lava front. 3. Measured SO2 levels have also showed a decreasing trend from a maximum of 8,993 tons per day to 2,621 tons per day. The still high concentration of SO2 gas emission suggests that there is residual magma degassing at shallow depth. In view of the above observations, PHIVOLCS-DOST is lowering the alert status of Mayon from Alert Level 4 to Alert Level 3 to reflect the overall gradual decrease of activity. Alert Level 3 means that there is less probability of a hazardous explosive eruption. However, the lowering of the alert level from 4 to 3 should not be interpreted that the unrest of the volcano has ceased. If there is resurgence in the volcano’s activity and the potential for explosive eruptions is perceived to be forthcoming, the alert level may be raised back to 4 but if there is noticeable downward trend in the monitored parameters, then the alert will be further lowered to Alert Level 2. Even before the decision to lower the alert level was taken, Albay Governor Salceda was welcoming the decline in Mayon’s activity with characteristic enthusiasm: ‘It really looks like Mayon drops dead. This is the first time in its recorded history. It seems that God answered our prayers and saw the collective preparations of a united people’. However, this may be a little optimistic. Extended periods of variable activity – declines followed by upswings – are characteristic of Mayon’s eruptive history: the first half of 2001 was marked by episodes of decline and resurgence, accompanied by changes in alert level, leading to significant eruptions in June and July of that year. There may very well be more to come from Mayon. Local farmer Pedro Balast, at 77 a veteran of 11 evacuations and several eruptions, has this to say: ‘I won’t go home yet, I will stay here for a while. Mayon should not be trusted especially that it suddenly dies down … eruption will come if there is a sudden lull’. Nevertheless, evacuees are heading home, although a 4-kilometre exclusion zone remains in place around the volcano. Posted by admin in activity reports, eruptions, Mayon, Philippines. Seismic activity remained elevated in number and size as the seismic network detected a total of 1,266 volcanic earthquakes. 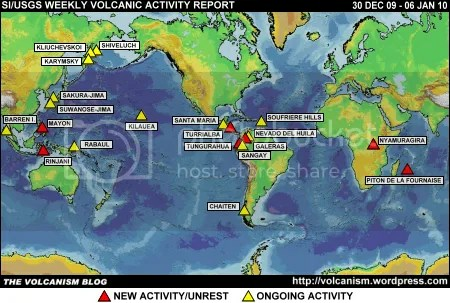 Many of these volcanic earthquakes were recorded at maximum deflection and have continuously occurred since 12:21 PM, 20 December 2009. Harmonic tremors were still continuously being recorded. Sulphur dioxide emission remained high at 6,529 tonnes/day. An intensified crater glow was observed during a break in the cloud cover, and booming and rumbling noises continued to be audible. Lava continued to flow downslope to a distance of about 5 km from the crater. The Manila Bulletin is reporting that an increase in alert level at Mayon from 4 to 5 is ‘imminent’. Level 5, the highest level, indicates that a hazardous eruption is ongoing, and presently, for all the disruption, that is not the case. There would have to be a marked upswing in activity from Mayon before level 5 would be justified – which is precisely what the Phivolcs official quoted in the story says. Meanwhile, Phivolcs has warned people to the south of the volcano to stay clear of potential lahar channels. Fears of infectious disease among the c. 47,000 evacuees crowded into shelters have led to the deployment of extra medical teams by the Philippines Department of Health. The psychological health of the thousands of people now facing a Christmas away from their homes and in the shelters is also being considered: soldiers in Santa hats have been distributing presents to children, and an appeal has gone out for ‘clowns and actors’ to provide entertainment and lift the evacuees’ spirits. Those who have ignored the evacuation order receive no such consideration: the authorities are considering making anyone who insists on staying within the danger zone sign a waiver to the effect that anything that happens to them when the volcano erupts is their own responsibility. Seismic activity dramatically increased in number and size. 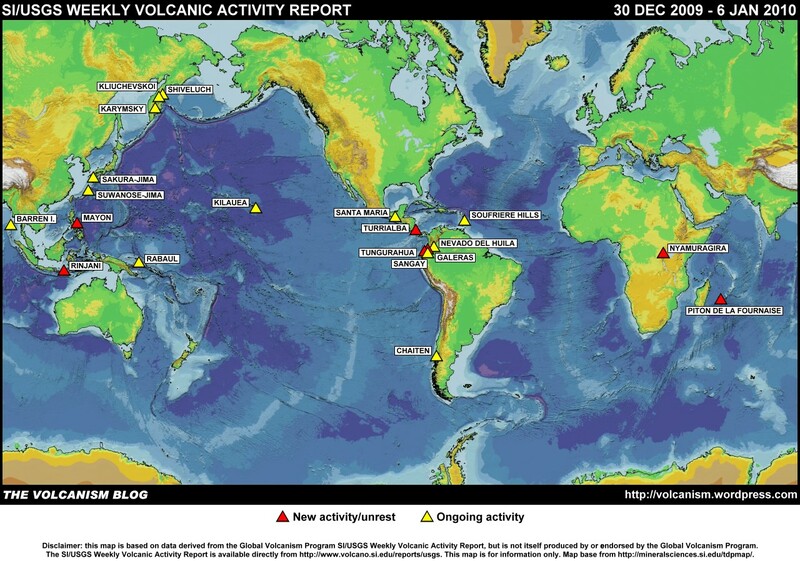 A total of 1,942 volcanic earthquakes was detected by the seismic network. Many of these volcanic earthquakes were recorded at maximum deflection and continually occurred beginning at 1221H yesterday. Harmonic tremors were also continuously recorded. Sulphur dioxide emissions have remained at a high level of 6,089 tonnes/day. Booming and rumbling sounds have been heard, intensified crater glow and continuous ejection of incandescent material has been visible overnight, and the advancing lava front has reached 5 km downslope of the crater. Strombolian activity has also been observed, with lava fountains reaching about 200 m above the crater. The evacuation of at-risk populations near the volcano is into its final stages, with the authorities taking steps to remove local inhabitants who have so far refused to leave their homes and farms. The lessons of previous eruptions, particularly regarding the potential reach of pyroclastic flows and lahars, have not been lost on the Philippines authorities: ‘The probability of survival in an eruption is zero if you’re in the danger area’, Albay Governor Salceda has said, ‘The solution is obviously distance’. Phivolcs has reassured people that Mayon, with its less volatile lavas, is ‘safer’ than Pinatubo: ‘Mayon’s possible eruption would not be in the scale and intensity of Pinatubo’s eruption in 1991, considered the second largest eruption of the 20th century worldwide, although Mayon’s current activity is more energetic than when it erupted in 2006’. Many local people have been reluctant to leave their homes and properties, with farmers proving particularly good at evading the checkpoints and returning home to check on animals and crops. The government have reassured farmers that livestock will also be evacuated to state agricultural stations where veterinary care will be available; meanwhile, the health of human evacuees, threatened by overcrowding and lack of safe drinking water, is also a concern. The authorities have made it clear that they will do everything short of using physical force to get people away from the danger zone: soldiers will be sent in to ‘nag them non-stop’ according to one disaster management official, and the deployment of clowns is being seriously considered. This is to notify the public that PHIVOLCS-DOST is now raising the alert status of Mayon Volcano (13.2576 N, 123.6856 E) from ALERT LEVEL 3 to ALERT LEVEL 4. This means that a hazardous explosive eruption is possible within days, thus, areas expected to be affected by such eruption will be accordingly extended. To ensure the safety of the public, PHIVOLCS-DOST is recommending an extended danger zone from the summit of 8 km at the southern sector and 7 km at northern sector. Areas just outside of this Extended Danger Zone (EDZ) should prepare for evacuation in the event explosive eruptions intensify. The previous bulletin, Mayon Bulletin no. 6, issued earlier on 20 December, reported 222 volcanic quakes and tremors over the preceding 24 hours, one of which was an explosive event that produced a 500 metre altitude grey ash column. Harmonic tremor was continually recorded. Steam plumes varied from dirty white to light brown in colour. Intensified crater glow and the continuous rolling down the slopes of incandescent material was visible at night. Lava had advanced 4.5 km downslope from the crater. Sulphur dioxide emissions were measured at 7,024 tonnes/day, a marked increase on the 2,034 tonnes/day reported in Mayon Bulletin no. 5 on 19 December. He said the number of volcanic quakes from 6:00 am Sunday (2200 GMT Saturday) increased to 463 and that the volcano was belching more sulphur dioxide into the air. However he would not give an estimate of when the eruption could take place. Meanwhile, weather forecasters report that a storm is threatening the southern Philippines with heavy rains, increasing the lahar risk at Mayon. Destructive and deadly lahars have been a feature of Mayon’s history: most recently, a typhoon in November 2007 turned deposits left by the eruption of July to October 2006 into disastrous mudflows, killing and injuring thousands. It is grim experiences like this that lie behind the urgency of the current evacuation effort around Mayon. UPDATE: A new report in the Inquirer gives Phivolcs figures of 463 earthquakes registered at Mayon between 08:00 and 14:00 on 20 December. The Philippine Institute of Volcanology and Seismology (Phivolcs) issued bulletin no. 4 on the eruption of Mayon at 07:00 today. Over the previous 24 hours the bulletin reports an increase in Mayon’s activity, with 248 earthquakes and tremors recorded by the seismic network, 50 of which ‘were of the explosion type’. Harmonic tremors were continually recorded. Explosions produced ash plumes to 1000 metres above the summit, and the plume drifted south-west. Continuous steaming produced ‘dirty white to light brown’ plumes, and an intensified crater glow was visible at night. Lava has reached approximately 3 km downslope from the crater, while incandescent blocks have descended to between 3 and 4 km downslope. Sulphur dioxide emission was high at 1,065 tonnes/day. The alert level remains at 3, and Phivolcs warns that ‘Since an increasing trend is noticeable at present, the possibility of hazardous volcanic eruption is high’. Figures for the ongoing evacuation are somewhat confused, but the Press Association reports today that more than 35,000 people have been evacuated from around Mayon, with around 10,000 more still to go. ABS-CBN News reports that ‘The Provincial Disaster Coordinating Council is expecting to evacuate all 9,946 families from the danger zones on Friday’. There is still reluctance to evacuate in some areas, and people have been re-entering the danger zone, despite the best efforts of the authorities. Farmers have been going back to tend their crops and animals. Asked about the relationship of the coming full moon with the impending explosive eruption, Baloloy [Alex Baloloy of Phivolcs] said that in the history of Mayon, it really does not follow a real pattern but several explosive eruptions have happened during or before the full moon.